Twelve-year-old Mira comes from a chaotic, artistic and outspoken family where it’s not always easy to be heard. As her beloved Nana Josie's health declines, Mira begins to discover the secrets of those around her, and also starts to keep some of her own. She is drawn to mysterious Jidé, a boy who is clearly hiding a troubled past and has grown hardened layers - like those of an artichoke - around his heart. As Mira is experiencing grief for the first time, she is also discovering the wondrous and often mystical world around her. So the other day I recieved a copy of a book called Artichoke Hearts by an author i've never heard of before, Sita Brahmachri. Since i'd never heard of the book or the author before, I didn't really know what to expect, but I soon got into things once I started reading it. 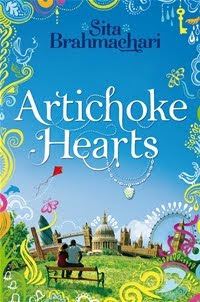 Artichoke Hearts is about 11 year old Mira Levenson and her amazingly artistic grandma, Nana Josie. Very early on in the book we discover that Nana Josie is ill and dying. As much as you expect the story to be sad and loomed over by the shadow of Nana Josie's death, its actually a very uplifting story showing us Mira growing stronger as a person with the help of her grandma. The book also captures a cute young love story as Mira gets to know Jide Jackson. We get to know more about Jide's life and we begin to understand him more as the story unfolds. This is a very sweet book and is great for kids, teens and adults alike. Its a story that you can laugh and cry with and i'd definitely recommend it to book lovers!